GUELPH, Ont. (U Sports) – It may not have been the colour they sought but the University of Guelph Gryphons men's soccer team will leave their first CIS championship in 24 years with a medal. The top-seeded Gryphons, behind two goals from rookie midfielder Alexander Zis, won bronze on their home pitch with a 3-0 victory over the Cape Breton University Capers Sunday afternoon at Alumni Stadium. Zis' second and third goals of the tournament lifted the OUA champions to a deserved medal. The Oakville, Ont., native, who scored eight times in his first season of university soccer, buried a free kick in the 29th minute. Zis struck again in the 51st when he tracked down a soft back-pass from a Cape Breton player and put it behind Ben Jackson, who had replaced starting goalkeeper Jamie Wilson for the second half. "It was hard for us to come out today and play but we have a strong group," Zis said about Guelph's emotional semifinal loss to the UQAM Citadins Saturday. "We're very excited about this moment." Guelph goalkeeper Ben Carinci kept a clean sheet with four stops, arguably his best coming in the 77th minute on a long, accurate free kick from First-Team All-Canadian Joel Eckert-Ayensa, as the Capers pressed for a goal. Chris Jacovou added a third goal for Guelph in the 86th minute. Senior Ethan Danielli, a late sub playing in his final match, struck the post with a hard shot and Jacovou banged home the rebound to the right of Jackson. Gryphons' captain Justin Springer, a Second-Team All-Canadian defender, was also playing in his last match and received a warm ovation from the home crowd when he was subbed off just before added time. Coach Keith Mason said the two departing seniors, both great ambassadors for the program, were in the thoughts of the players Sunday. "They've worked hard for this program," Mason said of Danielli and Springer. "They started the revolution, if you will. When they came, we were trying to make playoffs. When they're leaving, we are winning Ontario championships and bronze medals at nationals. It's a fantastic send-off. They've had five fabulous years." Cape Breton, finalists in the 2012 championship, entered the tournament as the No.2 seed, after securing the AUS title. 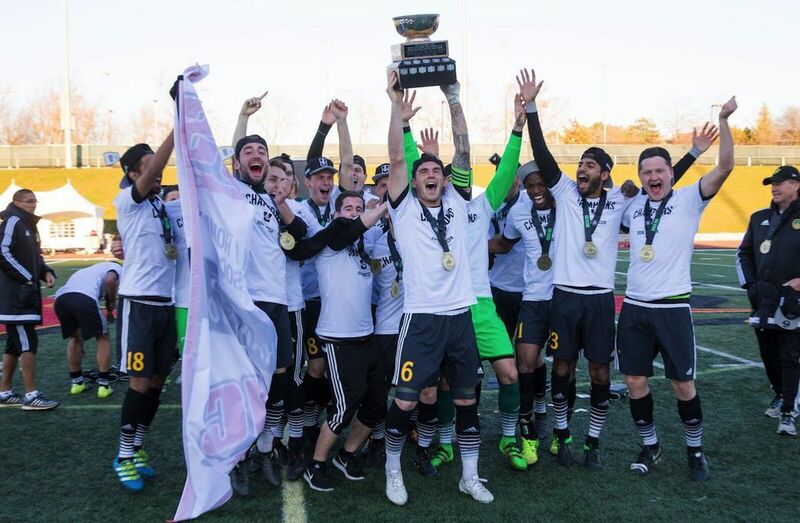 The Capers were initially aggressive in attack, showing the same passion they did in a semifinal loss to Alberta, in which they went down to 10 men. But on Sunday, they created only a few clear-cut chances and were whistled for four offsides in the first -alf alone. "We were missing a few players, we were a bit broken today," said Cape Breton's Second-Team All-Canadian defender and Nuneaton, U.K. native Daniel Pritchard. "We did want to win that bronze medal but unfortunately, it didn't go our way. "The season has been good for these boys. We've had a lot of new faces, like 9 or 10 rookies, so to be AUS champions is a big achievement. Coming into this competition, we did think we had a shot." Guelph took a while to gain a foothold in the match but they got a big boost midway through the first half. Youssef Zaghloul had a low, hard shot saved by Wilson in the 28th minute. The ensuing scramble resulted in a Gryphons free kick just outside the 18-yard box and Zis was able to curl in a wonderful, right-footed shot just inside the left post, which froze Wilson. He also scored on a similar set piece in Guelph's opening match against Acadia. "It was very gratifying to score today just to help the team win the medal in Ethan and Springer's last game," said Zis. "The first half, we were still in the game," said Pritchard. "Obviously, we did not take our chances. They took theirs and got that free kick in." Guelph last appeared in the national tournament in 1992. 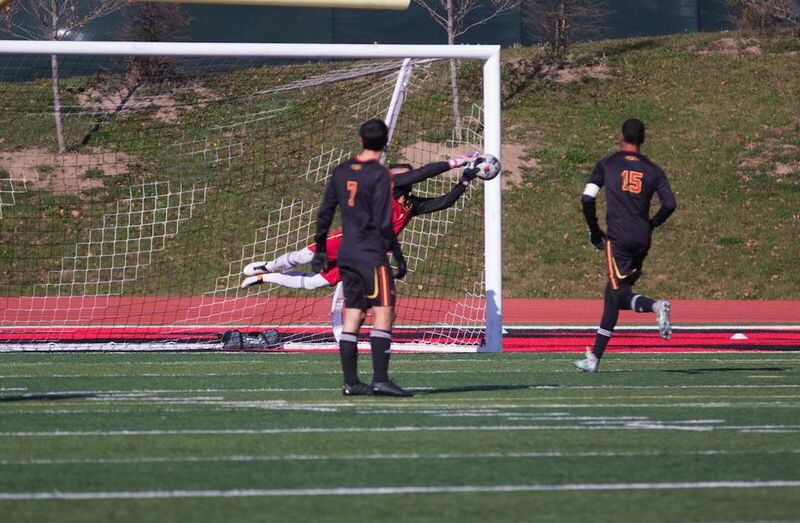 The Gryphons overcame a two-goal deficit against UQAM Saturday before conceding a late winner. "We couldn't have been any lower yesterday after what I thought was a great performance," said Mason. "They've got an abundance of character, they're fantastic young men. They've performed admirably, brilliantly all week and all season. "It took them five or 10 minutes to get into the game but once they got in it, they wanted to win it. We did what we always have all season - we scored three goals."